This Rumble ended on 2003-01-01 00:00:00.0. Leader: Leader of the Night People. Origin: She left her home in Qualinesti because the politics of the Dark Knights had become unstable. Weapon of Choice: An enchanted magical dagger of ancient origin. Arch-enemy: Sir Eamutt Thagol, Skull Knight, a decrepit wretch of a creature with incredible magical powers. Mission: Protect her people and land from the occupation of Dark Knights. Sidekick: Stanach, a short, fuzzy and funny dwarf. Quote: "We will die well. If anyone knows about it, if any one of us gets out of here to tell, they will be singing the song of us in every tavern in Qualinesti and all the best bars in Thorbardin." Leader: Leader of the Thundercats. Origin: He left his home on Thundara because the planet geology had become unstable. Weapon of Choice: An enchanted magical sword of ancient origin. Guided by: Guided by the dead (well sort of) spirit of Jaga the chief advisor and protector of his father. Arch-enemy: Mumm-Ra, the ever-living, a decrepit wretch of a creature with incredible magical powers. Mission: Protect his people and land from the plans of Mumm-Ra. Sidekick: Snarf, a short, fuzzy and funny... uhmm.. snarf. Quote: "Sword of Omens.... Come to my hand!" Mumma-Ra was at it again. He had tricked Lion-O into passing through the mystical portal and Lion-O needed to find out where he was. No doubt the villian had sent him somewhere dangerous and life threatening. The trees here were unfamiliar but not all that indifferent from the trees of Third Earth. Deciding that any direction is as good as another Lion-O picked a direction and started walking. Kerianseray deftly slipped through the dense foliage of the Qualinesti woods. The elven farmers she had just left had told her of gossip of a strange creature in the forest. It was rumored the creature was summoned by the Skull Knight, Sir Thagol to travel the forests and hunt down any elven rebels that might be hiding from the Dark Knights. The Lioness was used to such rumors. At one time it had been said that she killed an entire detachment of Dark Knights with nothing but her bare hands, well that and the fireballs shot from her arse. So she paid little heed to such chit-chat. Rounding an ancient oak the Lioness stopped and listened. Someone or something was moving through the forest. Slinking skillfully from one bush to the next Kerianseray spotted the creature. It was a great lion–man. He was snarling and cutting at the foliage hindering his passage. The Lioness pulled her bow and aimed for the creature. 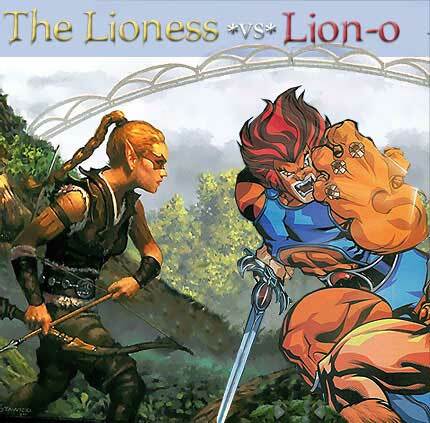 Lion-O, frustrated and irritated with the situation calmed down for a minute and stoped as his cat-like instincts warned him he was being watched. Turning instinctively he dodged an arrow as it flew by his ear. Pulling the Sword of Omens he snarled and advanced on this new threat.